What is Screen Printing in Textile Industry? Screen printing is new scopes of the techniques of stenciling in which a colored picture or image arise from the transfer of color through open areas in the sheet placed upon the fabric surface. What is Flat Screen Printing in Textile? In case of flatbed screen printing, the screen consists of a woven polyester material, tightly stretched across the underside of a light, rectangular frame. In printing period, the screen usually lies across the fabric width. The polyester fabric only allows the printing paste to pass through the mesh in those areas corresponding to the design being printed. A suitable coating blocks the remaining areas. There is a screen for performing printing each color and each consecutive screen sits on the fabric in the exact place for accurate registration of the multi-color design. In case of manual screen printing in textile industry, the fabric lays on a long table on top of the printing blanket. This blanket is typically a cotton or polyester cloth, water-proofed by a coating of neoprene rubber. If the fabric slips or deforms during printing, there is a loss of print definition. The fabric is therefore usually pinned to the printing blanket, or stuck into it with a water-based gum or thermoplastic adhesive. The latter type coats the blanket surface but only becomes sticky when heat softens the polymer. After printing the fabric and printing blanket separate. Washing the blanket take asides any gum and dye paste transferred through the fabric or beyond its edge. Thermoplastic adhesives are resistant to repeated washing and very durable when using water-based printing pastes. In some cases, a “back-grey” cloth is inserted between the fabric and blanket. This grey cotton fabric absorbs any printing paste that transfers through the fabric and thus avoids smudging of color on the back of the printed fabric. The printing paste is poured into the screen which placed on the fabric surface. 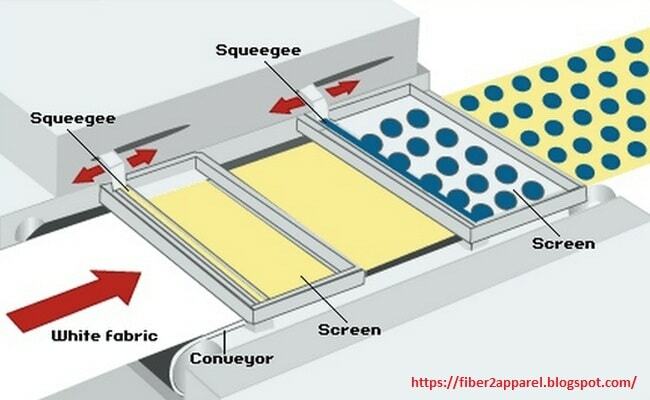 Drawing a flexible rubber blade known as a squeegee across the inner surface of the screen spreads the viscous dye paste and forces it through the open areas to print the fabric beneath. Four strokes or two strokes across the printing screen are normal; the number depends on the porosity of the screen and the printing paste viscosity. Each passage of the squeegee should transfer the same amount of printing paste to the printed fabric in any given print. For each point, the angle, pressure and speed of the squeegee must therefore be the same. In semi-automated screen printing, a mechanically driven squeegee transfers the color. This often has a pair of parallel rubber blades, with the printing paste held between those. When passing across the screen printing, only the trailing blade is in contact with the screen surface. The leading blade drops and the trailing blade rises ready for the back stroke at the end of the stroke. At the end of the each stroke, this removes the need to lift the squeegee over the residual paste. During printing, the zimmer rolling rod applicator moves through the printing screen along the fabric length which is driven by an electromagnet below the blanket. The roller is too small that paste can flow over it so that lifting is not needed. This type of roller gives less screen wear.